ANDRITZ will be presenting its innovative nonwovens production and converting solutions at IDEA 2019 to be held in Miami, FL, USA, from March 26 to 28 (booth 1412). ANDRITZ gives its customers support in every aspect of nonwovens processes and services with its most advanced expertise and complete technology solutions. In a continuously changing nonwovens market, the demands of first-class nonwovens production are increasing constantly – lower production costs, higher capacities and speeds, improved product quality as well as sustainable and intelligent production, to name but a few. ANDRITZ provides first-class air-through bonding, spunlaid, spunjet, spunlace, WetlaceTM, converting technologies and corresponding services to meet these demands for years to come. One driver of the spunlace market, for example, is decreasing weight per square meter by maintaining a high MD and CD tensile strength. Indeed, fibers account for a substantial part of the production costs. Very high productivity is needed for the lighter fabrics required with perfect uniformity. ANDRITZ provides technologies that can more than fulfill these challenges. The spunlace roll goods may achieve weights of 25 gsm and even less for ultralight spunlace fabrics, and the web uniformity is of excellent quality. In addition, maximized uptimes, high capacities and intelligent production processes are the main requirements in a modern spunlaid production plant. The newly developed ANDRITZ neXcal twin pro generation is the response to these demands. With its outstanding features, like high-speed production of up to 1,300 m/min, IIoT (Industrial Internet of Things) systems, clean production concept and operator-friendly machine configuration, it is a new milestone in nonwovens production. In addition, the spunjet process (in-line hydroentanglement of continuous filaments) can open up new business opportunities in terms of innovative products with added value, such as softness and bulkiness. Moreover, the converting process for hygiene products requires premium quality standards, high capacities, and top-level production efficiency by reducing labor costs and machine down time. Every detail is essential. The latest developments take customers a step ahead in terms of diaper production. ANDRITZ Diatec offers its customers a comprehensive baby diaper lineup and meets diversified market requirements. Adult care is another key segment of the converting industry with growing demands from manufacturers all across the globe. The ANDRITZ Diatec adult pull-up line responds to this demand with its high-quality components and innovative technology processes. Converting processes applied to the food pad industry have resulted in ANDRITZ’s dedicated line for food pads. The production of flushable/dispersible wipes is a frequently debated topic in terms of sustainablility and dispersibility of the product. Conventional spunlacing provides wipes with high tensile strength and softness, but they are only flushable due to their size and neither dispersible nor biodegradable. This means, these wipes can block the sewage system easily, whereas flushable wipes made on ANDRITZ WetlaceTM solutions (inclined wire forming and hydroentaglement), are 100% biodegradable and dispersible. In addition, fabrics produced using this innovative process comply with the latest EDANA/INDA flushability standards, passing all tests according to the new guidelines. ANDRITZ’s technology offers also a high degree of flexilibilty to produce other types of wipes, although not dispersible, but biodegradable and thus meeting customers’ needs exactly as well as supporting the strong tendency to move away from plastics and synthetics. Running complete lines calls for in-depth nonwoven expertise and excellent service. ANDRITZ offers a full service portfolio and thus can ensure improved uptime, productivity, and product quality – for years to come. This includes on-site support, specific training, line audits and troubleshooting, upgrades and modernizations, spare parts, and roll repair centers in Europe, North America, and China. In the USA, ANDRITZ is well supported in sales and service by its local branches ANDRITZ Küsters in Spartanburg, SC and ANDRITZ SHW in Torrington, CT.
ANDRITZ has developed attractive overall IIoT (Industrial Internet of Things) solutions for existing and new plants under its new technology brand Metris. 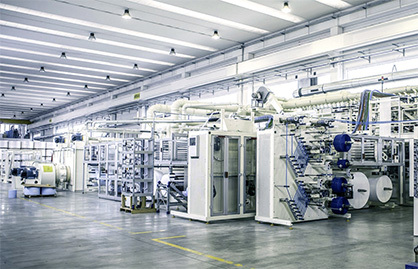 Nonwoven producers have high expectations of the greater plant efficiency and increased profitability that can be gained by networking machines and applying new technologies. Metris products are the very latest state of the art – they can be customized to suit individual customer requirements, and they make a substantial contribution towards helping customers achieve the best possible productivity and efficiency goals. The ANDRITZ team is looking forward to meeting you at IDEA to show you how to achieve smooth and modern production operations (booth 1412). ANDRITZ successfully closes its acquisition of Xerium Technologies, Inc.